The Robert Redford movie opens in theaters today. The one that's like Castaway, but on a boat instead of on an island. That may be your first impression, but it looks like this lost-at-sea adventure is much, much more than that. 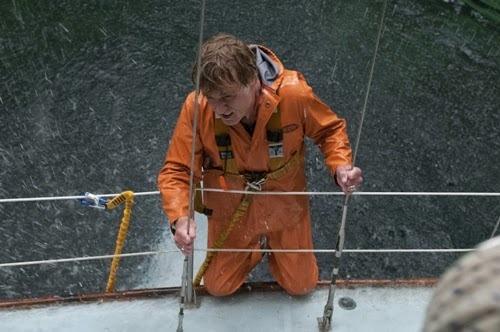 All Is Lost starring Robert Redford trying to survive the elements. Photo: Richard Foreman. Academy Award® winner Robert Redford stars in All Is Lost, an open-water thriller about one man's battle for survival against the elements after his sailboat is destroyed at sea. Written and directed by Academy Award nominee J.C. Chandor (Margin Call) with a musical score by Alex Ebert (Edward Sharpe and the Magnetic Zeros), the film is a gripping, visceral and powerfully moving tribute to ingenuity and resilience. Deep into a solo voyage in the Indian Ocean, an unnamed man (Redford) wakes to find his 39-foot yacht taking on water after a collision with a shipping container left floating on the high seas. With his navigation equipment and radio disabled, the man sails unknowingly into the path of a violent storm. Despite his success in patching the breached hull, his mariner's intuition, and a strength that belies his age, the man barely survives the tempest.